Another attraction for me is that it is the place that the poet Philip Larkin chose to live. I have been teaching in the Mercure Hull Royal Hotel which has a Larkin connection. Before being taken over by the Mercure group this hotel was The Royal Station Hotel. Larkin used to take his lunch here sometimes and met several of his Oxford colleagues here over the years. The hotel is one of the few places specifically mentioned in a Larkin poem. Whilst at the reception last week I asked the receptionist if they still used sheets of letter headed notepaper for guests. She affirmed that they did and passed me two crisp sheets of good quality paper. 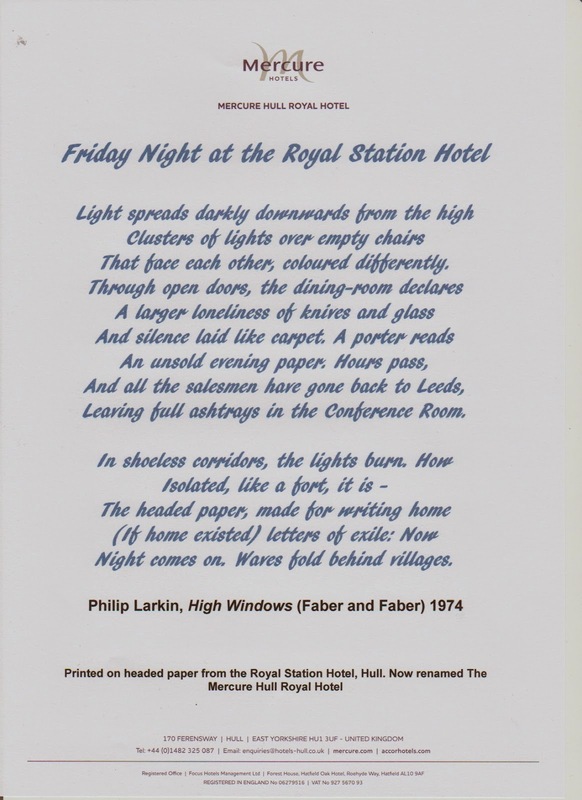 The reason I had asked was that Larkin mentions "The headed paper" in his poem "Friday Night at the Royal Station Hotel" which I think is a very poignant, if short, example of his work. On returning home I typed out the poem and printed it on one of the sheets. I think the result was worth framing. Therefore, I will award myself an early Christmas present and get it mounted and framed.